As you rode the banana boat at Adventure Sports, you will feel the sensation like a Jet Ski ride, although the speed is not like a Jet Ski. If Jet Ski ride can accommodate a maximum of 2 people, it will be very different from Banana Boat Ride as it can accommodate 10 people at once. 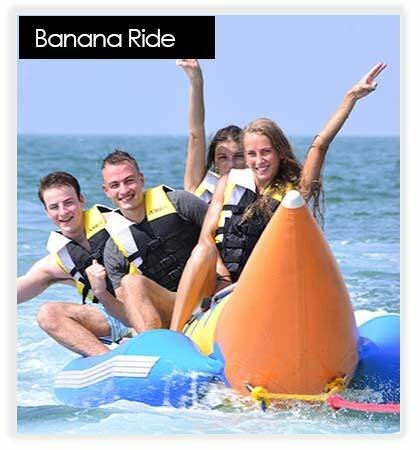 Most individuals who choose Banana Boat ride are fun seekers who have a vacation with family or group of friends. However, during the weekend, most of the banana boat ride participants are teenagers. So, if unable to swim, is it allowed to participate in banana boat rides? The answer is yes! Each banana boat ride participant, are required to wear a life jacket. Life jackets provided by the Adventure water sport staff. Also, there is a guide on the banana boat accompanied the participants. For Banana ride min 2 guest is required.